It's no surprise that I am a skincare addict, but I don't tend to actively seek out natural brands to use in my routine. I struggle with wondering how effective they will be, and if I will see the same caliber of results that I do with my other non-natural brands. To be honest, I still rely on certain ingredients (retinol and glycolic acid being the two most important for me) to deliver the strongest results and that's why I still keep them in my routine often in the form of serums and moisturizers. But recently, I've been introduced to more natural brands and have been enjoying adding certain products into my routine. I've always been a fan of Tata Harper (this cleanser is a holy grail), and find her products to be some of the best because they straddle the 'effective yet natural' divide quite nicely. Oskia is another brand that I've been fond of for awhile now ever since their cult classic Renaissance Cleansing Gel lured me in. Dr. Hauschka and Jurlique are both new to me, but I discovered a few products from each that I enjoy. 1. Tata Harper Nourishing Oil Cleanser - Since cleansing oils are my preferred cleanser for my first cleanse/removing makeup, I naturally gravitated towards this first. The oil is thick but glides on smoothly breaking up makeup easily and even removing stubborn mascara with little to no rubbing. Once I add water, it emulsifies into a comforting milk and my skin is left feeling hydrated, soft, smooth and balanced. No feelings of tightness or discomfort. If there is one thing Tata Harper knows how to do - it's make cleansers! 2. Tata Harper Restorative Eye Cream - I've been a loyal fan of Tata Harper cleansers and swear by this resurfacing mask, but I wasn't sure how I would feel about the eye cream (again, this is me questioning effectiveness). Fast forward nearly a month later and I have been blown away with how much I enjoy using this. It targets multiple anti-aging concerns such as dark circles and fine lines, and it helps keep the skin around my eye area taut and smooth. It's rich enough for the evening, but still works well during the day under makeup. Those looking for a more natural eye cream option for targeting anti-aging, this is a great one to try! 3. Jurlique Clarifying Deep Cleansing Gel - Now that it is summer, I love to add in more gel textures to my skincare routine. This Jurlique deep cleansing gel has small microspheres of jojoba esters that give a gentle but effective exfoliation to the skin. In addition, it contains willow bark that helps to kill any acne-causing bacteria so I've been using it when I feel a breakout coming on. It's refreshing on the skin, but I have found that I like removing it better with a damp cloth to avoid making my skin feel stripped or tight. 4. Dr. Hauschka Soothing Cleansing Milk - I don't know why it has taken me so long to finally try this product, because it has been on my radar for yearrrrrrs. I worked at Sephora when I first moved to NYC 15 years ago, and so many of our clients would come in and rave about this product. I finally feel a sense of completion now that I can participate in the Dr. Hauschka Soothing Cleansing Milk lovefest. This stuff feels heavenly when on, and literally envelopes the skin in moisture making it feel soothed, calm and nourished. I can use either with water or a damp cloth as my second cleanse, and find that it works even when my skin is at it's most sensitive. 5. 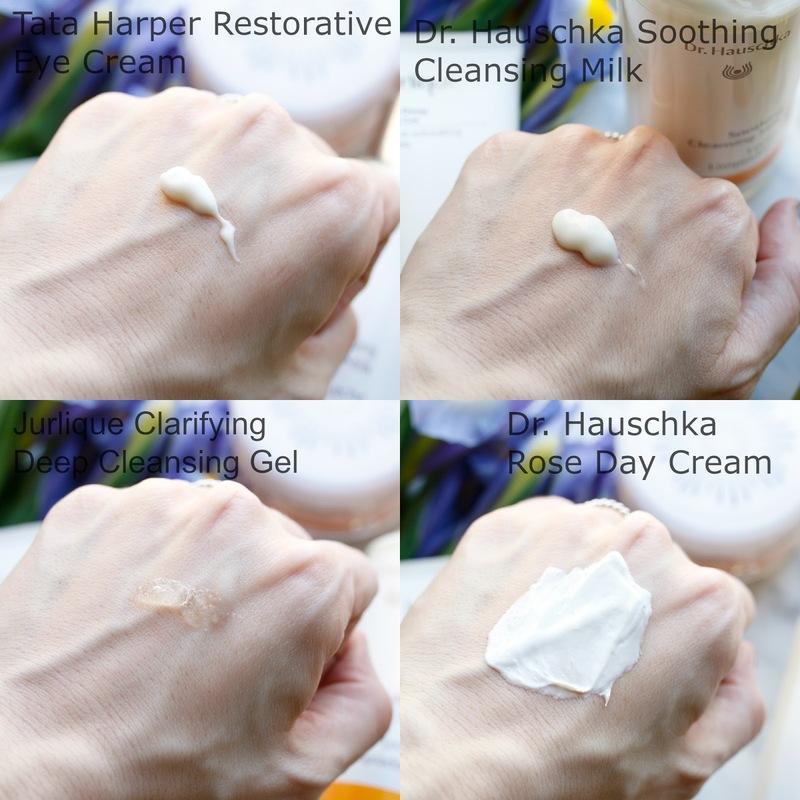 Dr. Hauschka Rose Day Cream - While the Soothing Cleansing Milk was something I've been wanting to try for a long time, the Rose Day Cream did not interest me as much. That is until Jennifer Lopez mentioned it on 'Watch What Happens Live' one night and then my interest was piqued! LOL! I mean, c'mon....her skin is everything! I was hesitant because it is so rich, but found that using just the smallest amount worked well for me. I was surprised to see how it made my skin glow, but not in a greasy or oily way. It's definitely more of a winter product for me to wear all over my face, but I used it recently on a few dry patches I've had from breakouts that are healing and it worked wonders on them! If you suffer from dry and sensitive skin, this would be perfect for you year round. Those with oily skin may find it works better in the colder months, and as a spot treatment in the warmer weather. 6. Oskia Renaissance Mask - After hearing angels sing when using the Oskia Renaissance Cleansing Gel, I was excited to give the mask a try. It is designed to increase cell turnover, boost radiance and reduce the appearance of fine lines - basically it's a new face in a jar, ha! Just the description alone had me excited, and once I saw the results, it lived up to all my expectations. My skin felt smooth, soft and glowed like I just had the best facial of my life. I swear each product I try from Oskia is better than the last, and can't believe it took me soooo long to discover this fabulous brand! I think I may begin defining the periods of my life as B.O. and A.O., Before Oskia and After Oskia. My skin only prefers to only live in the A.O. era going forward. I'm looking to try out the Oskia mask. It sounds great!